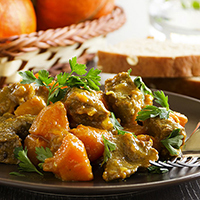 Stretch your taste buds beyond their comfort zone with this tasty stew. Heat oil in a large pot. Add pork and cook until browned all over, about 5 minutes. Remove pork with a slotted spoon and set aside. Add onions, green peppers, and garlic to pot and cook for 5 minutes. Add ginger, cumin, allspice, and crushed red pepper flakes. Cook for about 30 seconds, just until fragrant. Add stock, water, and diced tomatoes. Return pork to pot. Bring to a boil, cover, and reduce heat. Let simmer about 45 minutes until pork is tender. Add beans and plantains. Cook at least an additional 15 minutes. The longer you let this simmer, covered and over low heat, the stronger the flavors will become. Serve over cooked rice.